The S-locus is selected as one of RosBREED’s “Jewels in the Genome," because knowledge of S-locus variants is leading to more efficient breeding of self-fertile varieties of cherry, almond, apricot and plum. Self-fertility is the ability to set fruit following self-pollination. Self-fertility contributes to higher more consistent yields in many Prunus species, because pollen from self-incompatible almond, sweet cherry, tart cherry, plum, and apricot cultivars is unable to grow the length of its own pistil. In self-fertile selections, pollen borne in a flower is able to successfully grow down the style, resulting in self-fertilization and fruit set. Self-fertile varieties have the advantage of not requiring orchard space for “pollinator” varieties. Additionally, self-fertile varieties characteristically have higher yields than self-incompatible varieties, as compatible (“self”) pollen is always available at the perfect time. For many Prunus species; such as almond, sweet cherry, tart cherry, apricot, and plum; we know the two major genes that control self-fertility! These two genes reside at the S-locus on stone fruit chromosome 6. 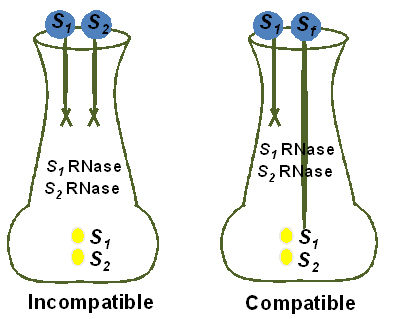 One gene is expressed in the style and encodes a cytotoxic ribonuclease, called the S-RNase. The second gene, expressed in the pollen, encodes an F-box protein, named SFB,that interacts with the S-RNase in an allele specific manner. Most of the self-fertile alleles described to date in these Prunus species disrupt either the S-RNase function in the style or the SFB function in the pollen, leading to self-fertility (Fig.1). Figure 1: Incompatible versus compatible pollination: If the S-allele in the pollen matches the S-allele in the style, pollen growth is arrested in the style. When all pollen is incompatible, fertilization does not occur and the fruit does not develop. However, when the S-allele in the pollen has a mutation that causes it to be self-fertile (Sf), pollen grows the length of the style, fertilization is successful, and fruit development follows. Photo credit: Michigan State University. Knowledge of genetic changes in S-RNase and SFB that lead to self-fertility has resulted in the development of simple diagnostic tests to screen progeny for self-fertility early in a breeding program. For example, the S-allele in the self-fertile sweet cherry varieties, ‘Lapins’ and ‘Sweetheart’, is called S4' (Boškovic et al. 2000). This allele has a four base pair deletion in the S4 SFB gene that results in the production of a shortened non-functional SFB protein. Pollen containing non-functional SFB protein is self-fertile and compatible on styles of all other cherry varieties. The DNA diagnostic test for self-fertility simply involves differentiating between S4 and S4', which can be accomplished by resolving the four base pair difference. Identification of self-fertile variants enables breeders to select parental combinations that maximize their chances of obtaining self-fertile offspring. Bošković R., Tobutt K.R., Schmidt H., and T. Sonneveld. 2000. Re-examination of (in)compatibility genotypes of two John Innes self-compatible sweet cherry selections. Theoretical and Applied Genetics: 101:234-240.